I do love fall. It is for sure my favorite season. And although I don’t enjoy the cold weather that is to come, I love the colors of the leaves, the crisp smell of the air and the feeling like change is coming. I am not a huge fan of Halloween, but I love me some Thanksgiving. Probably the best holiday of the year in my opinion. I feel like Thanksgiving is what Christmas is supposed to feel and be like before America ruined it with things like extravagant gifts and Black Friday. Anyway, a holiday where you think about all you have to be thankful for, gather with family, eat mashed potatoes… well those are pretty much the best things all in one day. Meet Whiskers the Turkey. He is an old whiskey bottle that belonged to my Papa. My Nanny had kept it many years and when Doug noticed it one day at her place she told us the story. Nanny is now gone, but I hold onto anything that would keep her memory alive. Papa died when I was 8, but I have a few things that were his as well. This turkey is probably a collectors item but in this house he found a home in the seasonal decor. Here is the Thankful Paint Chip Banner I made this year. Isaac’s school-made turkey is hanging in the kitchen too so he can see it each breakfast and say “Gobble, gobble”. I have a few leaf shaped bowls and plates that sit around the house in different places. Above the stove are some crafts that Doug’s grandma has made with the nursing home she volunteers for. (They also made the pumpkin on top of the refrigerator and the “Give Thanks” sign sitting on the mantel). I love this little half book. A super-craft-woman I know was making pumpkins out of old books and one of them split in half. I I got to take it home. I think it makes a great little stand. It was empty for weeks until Doug’s employer sent us a holiday card. Perf. So, though the decor is simple and basic it makes me smile. I am reminded to be thankful each day for all the blessings the Lord has given me and our family. He is so good to us. Happy Thanksgiving to you, from Project Momma. 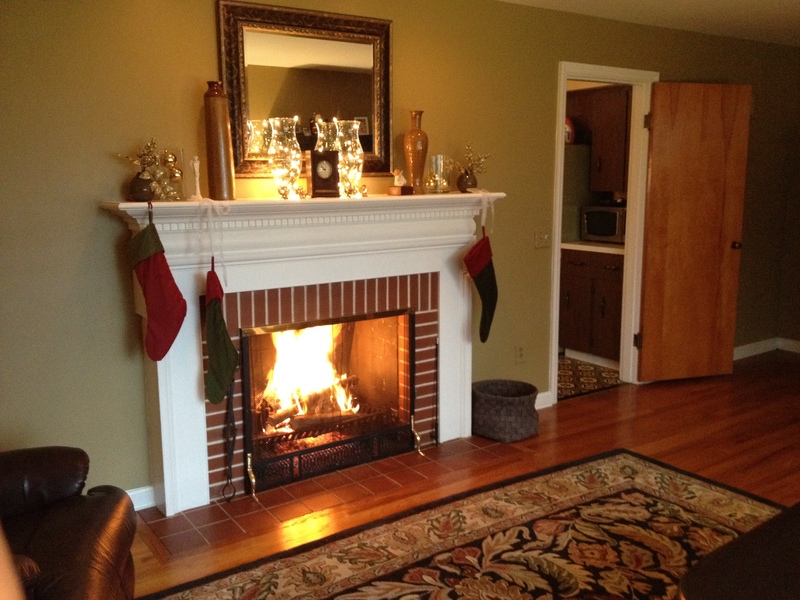 This entry was posted in home decor and tagged decor, fall, mantel, thanksgiving on November 28, 2013 by projectmomma. 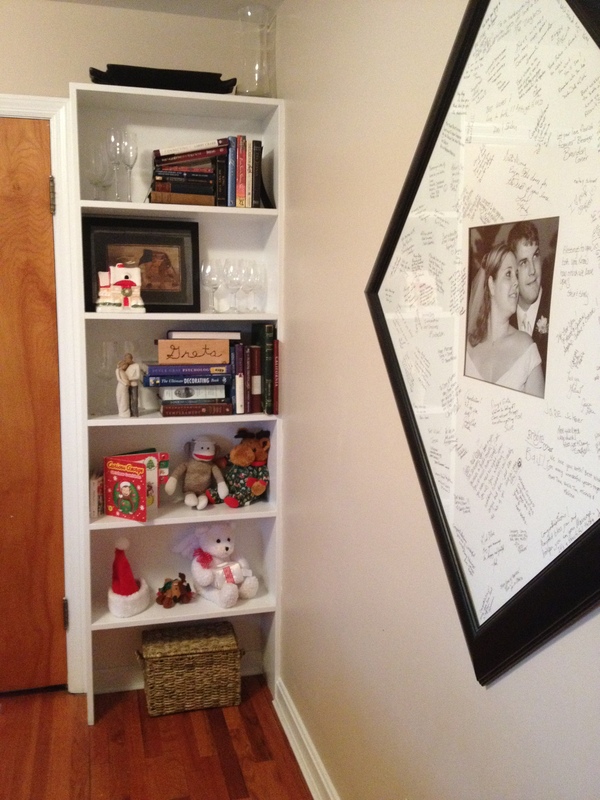 I am starting to add pictures of our home to the blog. Eventually we will have a “House Tour“! Right off our kitchen is our dining room. It is actually officially our 3rd bedroom. When we bought the house 4 years ago, we didn’t need a 3rd bedroom, especially one right off the kitchen. So we made our great room into an extra large living room, and made this room our dining room. The room used to have wallpaper and 80′s shag carpeting. We peeled walls, pulled carpet, painted, and added trim to this room. In our previous rental house we did not have a dining room. I was also spending more time in the kitchen preparing meals for my man. So I was really excited to have a place to sit and eat and enjoy meals together. The table was a hand-me-down from Doug’s aunt and uncle. It used to be a blond wood but Doug spent a lot of time sanding and staining this bad boy. He chose the stain color to match the bench. We only had four chairs passed onto this, but the bench was another “hey do you want this?” from Doug’s grandma. The highchair was handmade by Doug’s dad for Isaac. Isn’t it awesome? It is super sturdy! Doug stained that to match as well. On the wall behind the table are a few Pottery Barn shelves. Maybe the only thing I have purchased from the actual store, not on sale! They were my birthday present our first year married. I still adore them. The black base cabinet was a $10 purchase from goodwill about 12 years ago. It once was a TV stand in my apartment; I painted it black way back then, but it is due for another coat. I used to store service ware, glass dishes and vases, etc. until Isaac became mobile. Then the glass went bye-bye. I would love to get doors on this friend so I could use it for safe storage again. In fact we even bought the hinges and have spare wood for the doors in the basement. Gotta make my way onto Doug’s project list! 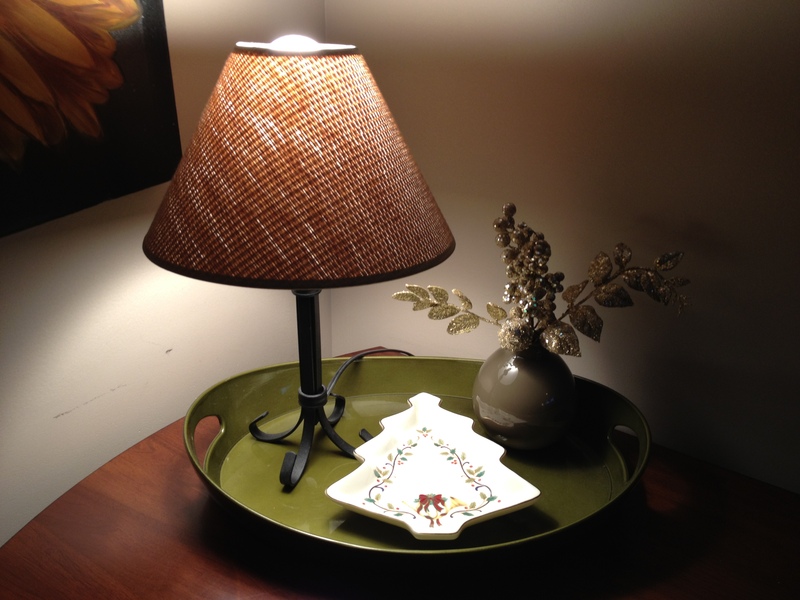 This entry was posted in home decor, house tour and tagged decor, dining room, simple on September 25, 2013 by projectmomma. My Shiny Angel Christmas Mantel (and more)! 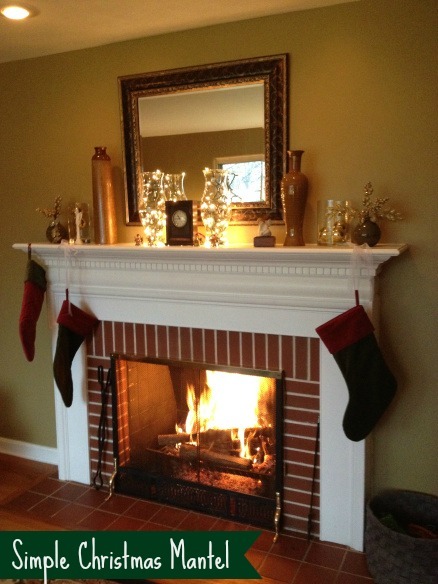 I love the holidays and there is something that I’ve been looking forward to all month long… a decorated mantel! I blame Pinterest. I had hoped to DIY some things, but time got away from me. I ended up just winging it with what I already had in the house. So here is what I call – My Shiny Angel Christmas Mantel! Below is what our mantel looks like normally. Simple and I admit kinda boring. Thus, my hopes to get some fun decor up on this bad boy. The mantel is one of the areas that my son cannot reach. So I can put pretty and delicate things up on my adult mantel and he cannot destroy it! And that, my friend, it is a luxury that I should be taking more advantage of!! So, I started with a clean slate. This helps me focus on what could be as opposed to what was just there. I kinda had a little plan in my mind, similar to what I had up there last year. I like the stockings hung off the mantel. I used command hooks to hang them with ribbon. 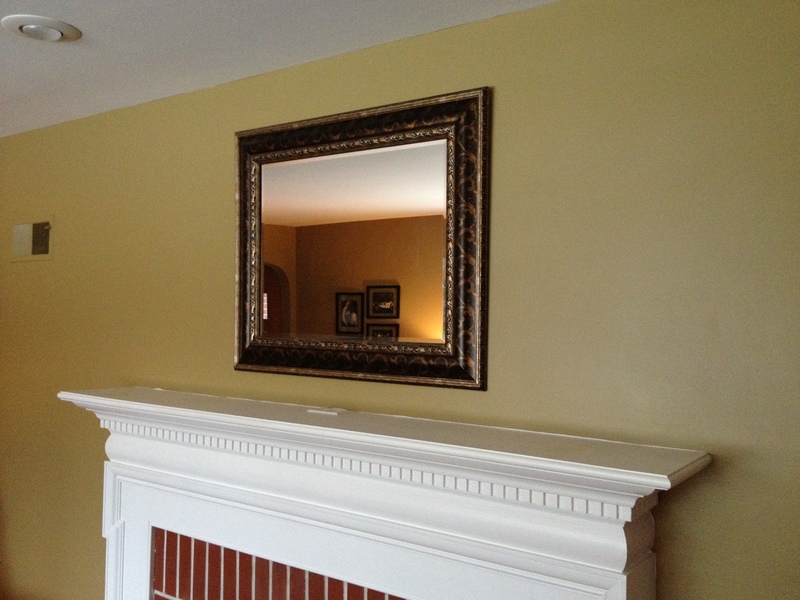 In years past, I took cues from off the deep red and hunter green colors for ideas for the rest of the mantel. I love my Nutcrackers. I danced in the Nutcracker Ballet for many years as a child and teen, so they are something that I love to pull out each year. 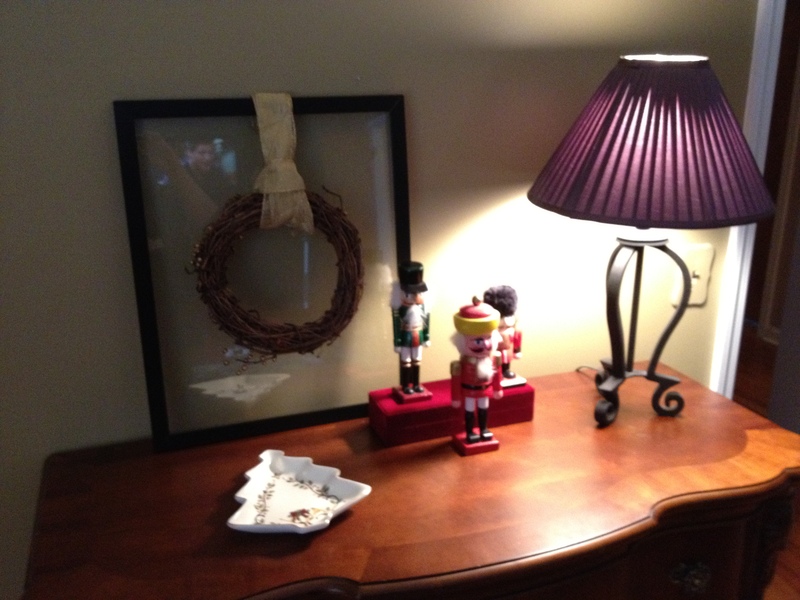 The last few years they have been on the mantel, so that is where I started…. and got stuck. Then I found these gold branch and berries that I had picked up from Michael’s earlier in the week. I was not sure where they would end up in the house, but I think they were $1.30 per clump. I had the small green vases in the Living Room and just popped them up there. I really liked the glittery shimmer as the shine from the Christmas lights bounced off the gold glitter. It needed some height, so I put the gold vases that are usually on the mantel back up there. Hmm, could I do something with the glass vases? I have tons of these in different shapes and sizes. Still a tad boring. I needed more gold or a theme…. thinking…. …That is when my son woke from his nap. I went in his room, changed his diaper, then saw this angel music box that sits in his room. I love it because it belonged to my grandmother; she passed away about 6 years ago and we were very close. This angel is very special to me. I loved the idea of bringing it out to the mantel. I had my theme! So, I went digging in the Christmas decor for more gold and angels. I found this set of 4 angel ornaments given to me by a friend. Perfect! They are each unique, playing a different instrument. They added sweetness and individuality to the decor. I found another ceramic angel given to me by a girl I used to care for. She was 7 years old at the time and I am pretty sure that she bought it from her school Christmas sale. You know the kind… where you give a kid $10 and they come home with 10 gifts? It is special to me though, because she thought of me and wrapped it up. She is now 22 and probably has no idea that I still have it. I forgot to get a close up of it though, sorry! 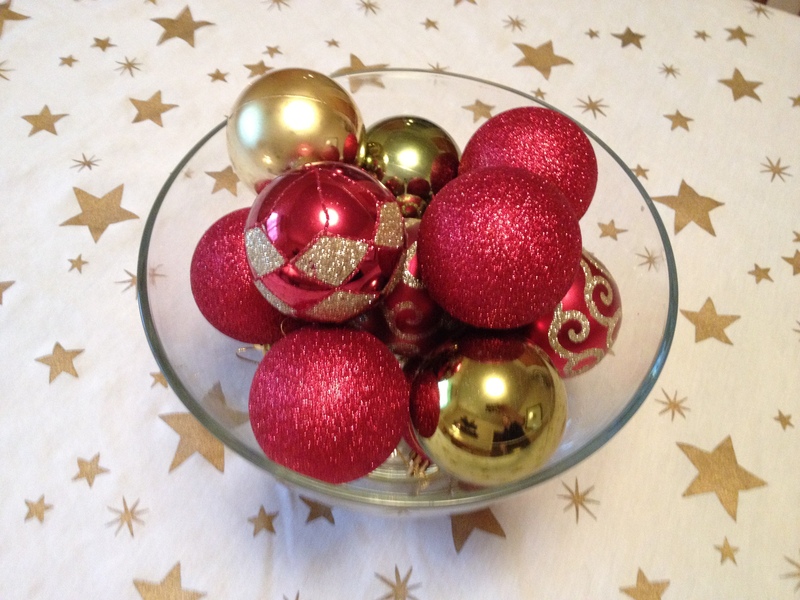 I also found some simple gold ornament balls that I plopped into the glass vases. So here is the finished product. I really enjoyed how it turned out. Not only festive and free but angelic and sentimental. We also got rid of the baby gate and replaced it with a fire! We are living on the edge people. Decorating this year was harder than is has been. Isaac is now 15 months and into everything. He is so curious and smart and we cannot be with him every second. 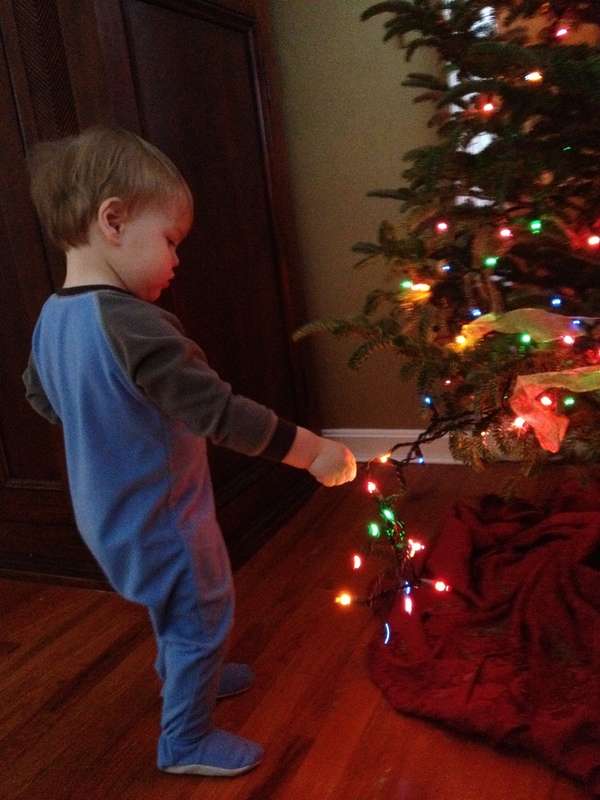 Below, you can see him in his daily activity of investigating the tree lights. So, we limited the decor we put out and even skipped ornaments on the tree. Counters and tabletops were safe! Ornaments in glass bowl and star tablecloth on our Dining Room table. Some kid friendly objects on the bottom shelves of this bookshelf in our Dining Room… …and, the other gold branch and berries found a home in a vase on our kitchen table. 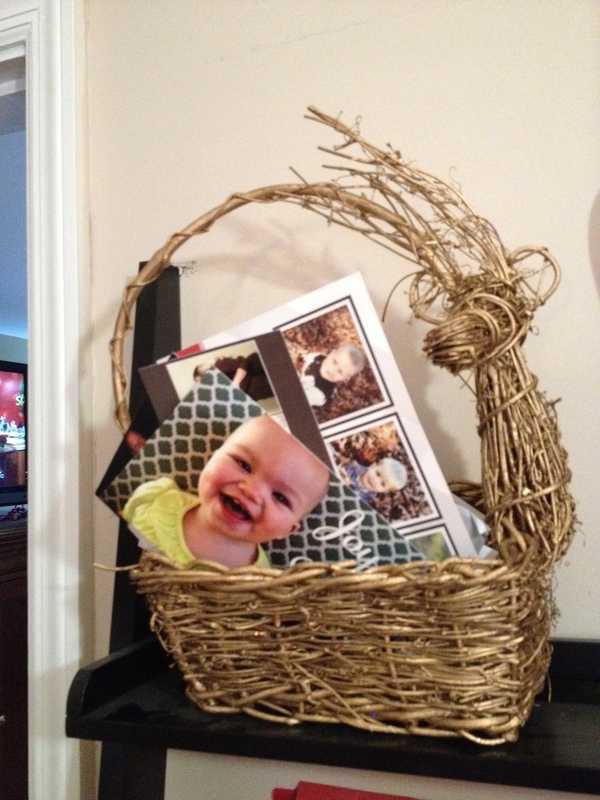 This gifted reindeer basket has been the card catcher for the last few years, though I’d love to make something clever to display them next year. Check out that cutie in the card in the front – - easily my favorite card this year! (That is one of Isaac’s girlfriends. Her mommy blogs over at hildagotrocks.) …and I am sure you are wondering where my Nutcrackers ended up. They are on the Living Room buffet. You also might recognize that red velvet box of from the angel ornaments? I used it to add color and height to my disply. Use what you got, right? (The candy dish was swapped out later). The frame usually hangs on the wall with a family picture, so I just emptied the frame and hung the wreath with ribbon. Easy. Well, that is all I got. I hope you enjoyed as much as I did! Now it’s time to enjoy that fire. This entry was posted in diy, home decor, project and tagged christmas, decor, diy, home, mantel on December 20, 2012 by projectmomma.